Phonicalia Media Network produces thoughtful and passionate podcasts on a growing range of topics. Hello Atelier takes you into the studios of artists and makers. 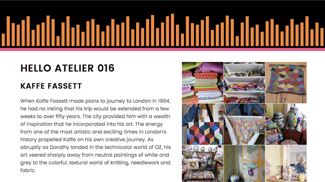 In this podcast, Kaffe Fassett talks about his work as a teacher, his unending drive to create, and those inspiring first years when he found his calling in textiles.